I'm not sure how I feel about reissues from a reviewer perspective but from a listener's perspective they serve a purpose, especially if that purpose is to bring bands and their music to new audiences. I think that's what UK label Cacophonous Records has tried to do with this reissue of Sigh's 1995 album "Infidel Art" (released in November 2016). Originally released by the same label in 1995 on CD and then on various formats via various other labels since then, the six-track record has been embellished with re-mastered audio and two added bonus tracks. Sigh has rightly been recognised as one of the originators of avant-garde black metal and this gives new listeners a change to trace the sub-genre's roots back to it's beginnings. Sigh originated at a time when black metal was in a simpler place and despite being active for many years, I’ve overlooked them somewhat to my behest. They certainly live up to their avant-garde billing on opener Izuna, which goes through different movements with screeching guitar, orchestral textures and raw shrieks. Granted that could be a description of many a band but the way in which Sigh forged their sound has meant that they were (and indeed still are) leading the way musically. The Zombie Terror initially sounds like a traditional sludge/stoner song before the song changes pace and the mix of clean chants and harsh shrieks take over. The orchestral synths and keys distract you from the madness yet also fit in perfectly amongst it. The guitar that leads to the three-minute mark of the song is very well executed and reminds me of the more sensitive solos performed by doom/death bands of old. At times Sigh are very introspective and inward looking with their music, but you never quite know what’s coming at the next turn. If ever there was a piece of music that sound’s most like a hellish lullaby then its Desolation. It wouldn’t be out of place on the soundtrack of a Tartan Asia horror film in the intro is anything to go by. That intro feeds though and gives way to a minimal, slow march into the bleak void of it’s creators. 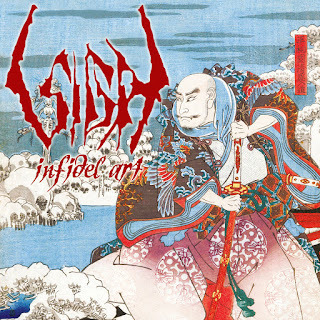 Sigh becomes more and more experimental as they go on “Infidel Art” and while it may seem primitive so some (who’re more used to today’s big budget records), it has a lot more warmth and real atmosphere. The use of what sounds like either a flute or a tin-whistle at the beginning of The Last Elegy adds a traditional layer to Sigh’s music, while once again the bewildering mix of extremity and bombast takes a bit of adjusting too but is exciting and rewarding in the end. The synths once again play a big role in the song-writing and the overall delivery. Suicidogenic is the kind of ambient piece that you’d expect to here on a DSBM record and I guess Sigh may have been slightly responsible for that sub-genre because of it. It’s a much shorter song than it’s predecessors and the ambience heard early on is ravaged by grinding, black insanity later on. Beyond Centuries is the last song that featured on the original version of “Infidel Art”. After the urgency of Suicidogenic, it’s back to business as usual with the addition of an Organ for added horror-esque feeling. Well, that and some bluesy/jazz-like piano. This reissue features two alternate versions of songs from the original album, starting with the “Lamentation” version of The Zombie Terror. There’s not a massive amount of difference between it and the original to these ears. The second bonus song is the “Chthonic” version of Suicidogenic. This version is over a minute shorter than the original if that makes any difference!. I don’t mind bonus tracks but I think that in the case of this record, they should have just kept it simple. Sigh, like many of the black metal bands from their era and beyond, don’t need embellishing. They were, are and will carry on as one of the most innovative avant-garde black metal bands that exist today. The Cacophonous Records bigcartel page is currently down at the time of writing.